Super-resolution on GIF Quantum® LS imaging filter | Gatan, Inc.
Thon rings tests performed using GIF Quantum LS imaging filter (K2 camera mounted at the end of GIF Quantum® filter on a Krios microscope) shows signal at near super-Nyquist frequency under low-dose conditions typical of cryo-electron tomography. 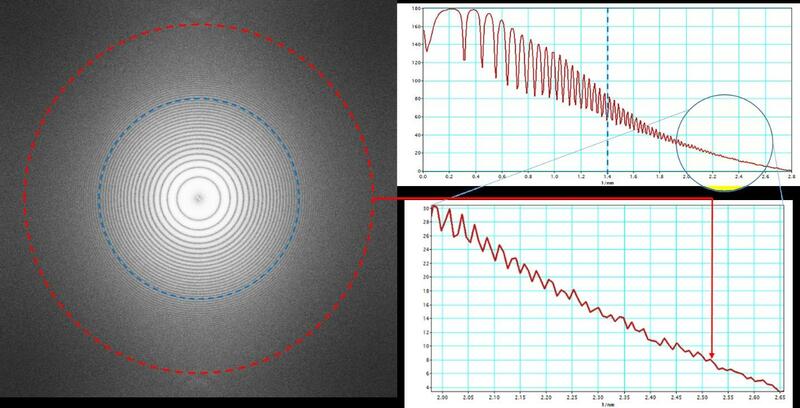 Left panel is Fourier transform of amorphous test sample (PtIr). Dashed blue circle indicates physical Nyquist, dashed red circle indicates 0.90 super-resolution Nyquist. Upper right panel is the rotationally averaged intensity. Blue dashed line indicates physical Nyquist. Lower right panel is a magnified detail of the averaged intensity profile, showing last visible Thon ring at 0.90 super-Nyquist (red arrow), corresponding to 4 Å at the specimen. The data was acquired with a total dose of 61 e/Å2 and a defocus of 6.05 µm. Results show that researchers can now match sub-tomogram reconstructions to atomic models and address questions about molecular interactions in the undisturbed environment of the cell.